Being involved in a dog bite incident, whether you're the dog's owner or the person who's been bitten, is an unpleasant experience. Understanding the laws regarding dog bites can help you best deal with the situation. The "one free bite" rule allows an owner to escape liability if he or she can prove no prior knowledge of any aggressive behavior from the dog. This is only an option for the first incident. Owners are legally liable for the bite regardless of whether it's the first bite. These are known as "strict liability" laws. When determining liability, states have either gone with "common law" or state specific statutory laws. Common law refers to the idea that if an owner is shown to be negligent, he or she is liable for the injury caused to the victim because of the owner's failure to control the dog. Unlike common law, under statutory law the state imposes additional sanctions, mitigating factors or stricter liability that supersede common law. When reviewing statutory law, many states allow for mitigating factors that increase or decrease liability depending on the state. The owner was aware the dog had aggressive tendencies. The dog was off-leash in violation of local leash law ordinances. The dog was provoked prior to the bite by the victim or the dog was being abused. The dog was provoked but by a child under the age of four. The incident occurred on the owner's property or in public. The victim was in the process of committing a crime like illegally trespassing on private property. The victim was a federal, state, county, city or law enforcement officer carrying out their job on or near the property. The dog has rabies and the owner can prove he or she was not aware. The dog was playing and not displaying aggressive behavior. The victim was bitten by a police dog while being apprehended for a crime. Within each state, you can find leash laws, also known as "running at large statutes," enacted by local municipalities to provide protection for victims of dog bites. In general, leash laws hold that an owner must keep their dog on a leash at all times when out in public. If their dog is off leash and bites someone, they are liable for the incident. Some localities may also include breed-specific legislation that prohibits certain dogs from living within its legal boundaries as well as dangerous dog laws that require certain breeds or dogs deemed dangerous by the court to wear muzzles in public. If your dog bites someone and you are found liable, you may be forced to pay the medical expenses for the victim, as well as extra money for time off work and emotional distress. If you have homeowner's insurance, you may be covered if you are sued but your policy may be invalidated if you failed to meet guidelines. For example, some insurance policies do not cover dogs of certain breeds. If your insurance company does cover the cost, your future coverage may remove protection for dog bites and your premiums may go up. 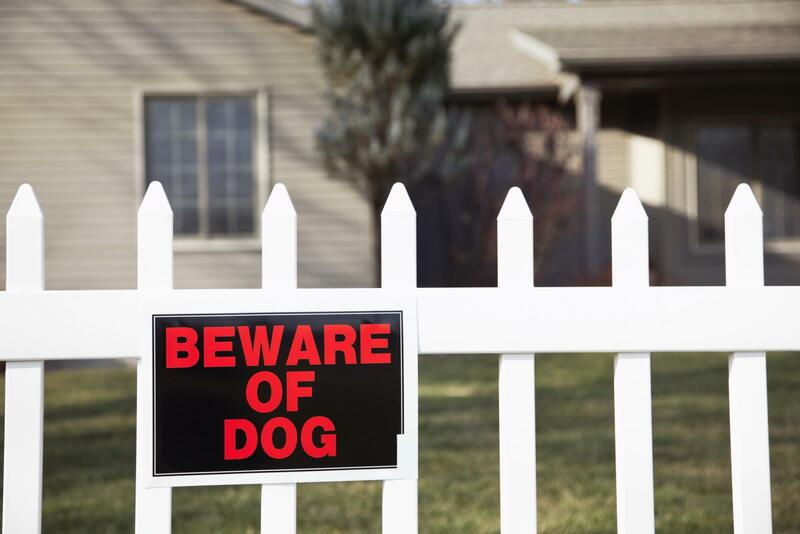 Some homeowner's policies may also cover dog bites that occur outside of your legal property. Your dog may be confiscated by local animal control and quarantined temporarily if you cannot prove the dog's rabies vaccinations are up to date. Your local animal control office may declare your pet a "dangerous dog," requiring you to muzzle him or her in public. You may also have to secure your property to keep the dog from getting out. Some courts may also require obedience training or work with a qualified animal behavior professional. Depending on the severity of the attack and your dog's history of bites, your dog could be taken from you and even euthanized if the court deems it a danger to society. Dog bite cases follow the same statute of limitation in your state as all other personal injury cases. These can run from two to six years, and the time starts from the day of the injury. In some states, if the victim is a child, the statute "clock" may be put on hold until the child turns 18 and can sue if the parents did not sue on the child's behalf at the time of the incident. If you have a dog that may have a propensity to bite, or you've been bitten, it's important to find out the laws in your state right away. For the dog owner, prevention is key. For the victim, familiarize yourself with your rights to determine if you can recoup losses for medical and other expenses.